The only thing I dislike about this episode is Sinclair's flying/fighting in the dogfight at the transport. I realize his description of his maneuvering (like it was his first time in a Starfury, like the training wheels were still on it) is for the benefit of the viewers (connecting the dots for them, empathizing the flight controls of the Starfury), but if he'd reacted that slowly in combat, he'd have been dead. The raiders would have obliterated him. Compare that with the dogfights in Crusade. The ones in Crusade (e.g. War Zone, Each Night I Dream of Home, etc.) were much faster and more realistic. After my B5 marathon, I am now watching the series more slowly and allowing myself time to notice details - and to post about them. I agree with the previous posters who have written that the question of rating this episode depends on what one compares it with. Compared to normal TV fare (which I don't bother to watch) it's excellent, but knowing what comes in future B5 episodes, this one doesn't stand out particularly, except in its function as a beginning to regular broadcasting. Changes from "The Gathering" are what were most noticeable for me. I suppose some network officials wanted Delenn looking more femininely attractive than she originally was shown, since she was planned as a love interest for the station commander - which is ambiguous for me. I could have accepted her more alien, androgynous appearance. I do like the way news broadcasts are shown as being important to the characters, as well as the role of entertainment shown by Garibaldi's comic show watching. Knowing the direction the Ivanova/Talia relationship will take, I can't help but wonder if the sleeping part of Winters is already directing the telepath. She certainly does not let herself get discouraged by Ivanova's setdowns! Last edited by Estelyn; May 14th 10 at 15:46. I suppose some network officials wanted Delenn looking more femininely attractive than she originally was shown, since she was planned as a love interest for the station commander - which is ambiguous for me. I could have accepted her more alien, androgynous appearance. In this case we can't blame the network. It was a combination of two things that caused the change. First, Delenn was originally supposed to be male but played by a female. The electronic changing of her voice from female to male just wasn't good enough, though, so it was dropped. Also, Mira Furlan was concerned that the amount of prosthetics covering her would stifle her performance. Given the two situations together, JMS bit the bullet and went ahead and made Delenn female from the start and had the prosthetics modified. Interesting theory on Talia, Estelyn, although I think the feelings are genuine on both sides by the end. this one doesn't stand out particularly, except in its function as a beginning to regular broadcasting. There is some interesting arc stuff here too I think: we learn about Londo's dream and that Londo and G'Kar will kill each other in 20 years; there's some foreshadowing for season five when G'Kar predicts that the Narns will have their teeth at the Centauri's throat one day; and there's symmetry between this episode and "The Coming of Shadows" with Londo heading to kill G'Kar here and G'Kar heading to kill Londo in the later episode (the opening scene in this episode appears in Londo's dream in that episode as well). Thanks for the explanation, Jan! I had the same perception of the relationship, KoshFan. Good reminder of important arc information, JoeD80. If I recall correstly, Ivanova (or "Control") precisely expresses the belief that Control directed Talia to seek out a relationship with Ivanova to use it for Control's information gathering. This isn't to say that Talia's real feelings weren't guenuine, but, I definitely believe the story was meant to make us believe that Control did deliberately seek out the relationship with Ivanova. Just watched this one last night for the first time in several years. I give it a "C," because the acting is stiff, the writing is also frequently stiff ("I know Londo, more than you'll ever know. And I know that it burns" or Sinclair's whole "Ignore the propaganda" speech) and the editing was kinda' choppy. Some of the scenes are simply too obvious and pointed, and the Ragesh III plot is obviously a make-work thing to give the various subplots and exposition some structure, rather than a 'real' organic plot of the kinds B5 specializes in. That said, I liked it quite a bit, I really did. Ideas-wise and worldbuilding-wise, it gets high marks from me. Basically they did more of that in 45 minutes than TNG did in an entire season in those days. I've decided to re-watch the entire series in chronological order (Including the spinoffs) and review them in my "Retrospeculative TV" column, probably starting early next year. What an excellent first episode this is! It is interesting to both the first-time and the repeat viewer. There is SO much story information in there, so many seemingly little things that will turn out to be important later. Every detail matters, but all this information is presented in sort of a casual manner, so that it’s not overwhelming or confusing for a first time viewer. There’s also plenty of action to pull you right in, and I think it shows quite well what kind of show Babylon 5 is going to be. It’s not going to be a “monster of the week” type show. I started my B5 watching with Midnight on the Firing Line originally. I didn’t see the pilot until much later, although someone had filled me in on what happened in there. I can’t remember how I felt about it back then, but obviously I continued watching and came to really love the show. Those Centauri we see at the very beginning of the episode at Ragesh III are wearing interesting clothes. That is to say, they address each other with what sound like military titles, so they are either military or at least some kind of security. The clothes look civilian. It occurred to me for the first time ever that I don’t know what Centauri military looks like. Other than those palace guards with the shiny helmets, everyone always seems to wear their sort of fancy dress. Are palace guard uniforms the same as military uniforms? Are they only for lower ranking individuals? These guys didn’t seem too fancy, either. Their clothes were definitely less ornate than what we see on Londo and his peers, or even on Vir. What on earth (or not on Earth, as the case may be ) is Garibaldi eating in that scene of him in the Zocalo? It looks like a kiwano sitting on some other fruit, maybe grapes, or possibly blackcurrants? And then some mysterious pyramid things (see screenshot below). I wonder if that fruit is grown in the hydroponic gardens. In later episodes, characters sometimes make a big deal out of foods that are hard to get on Babylon 5, but I have never been able to make sense of what is easy to get and what isn’t, or what is locally grown and what isn’t. Londo’s quarters. Do they look different later in the show? Or is it just that this early on he hasn’t filled his space with as much Centauri stuff? I really like that scene where Talia Winters finally catches up with Ivanova and they have their little chat at the bar. But, the weird thing about it is that it includes Ivanova telling Talia all about what the options are for telepaths who don’t want to join Psi Corps. Clearly Talia would know this, and the information is for the viewer’s benefit. It feels a little weird, but then I guess it’s hard to stick that information in there so we, the audience can know what’s going on but still have it fit in the dialog and make sense. Londo’s vision of his death. He says this is common among Centauri. 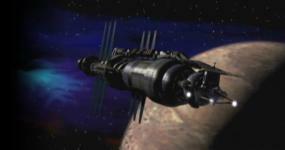 Is this a magical element in the Babylon 5 universe? There could be some other convoluted explanation for this , but most likely it is indeed a fantasy element. If so, I think it’s the only one in the whole storyline. Everything else has some “sciency” explanation, does it not?